The weather is beautiful on the east coast and we are typically found walking the kids and the dog after dinner. You can set your clock to our routine of walking through the woods, over the bridge to the "playground in the woods", as Logan has named it. We luckily have so many playgrounds in our neighborhood that each one has a name. Logan has an eye for finding little trinkets as we walk. Some one's missing shiny yellow button, a taillight to a 1950's toy car...and he believes them to be treasures. It reminds me of a story from my favorite author, Robert Fulghum, in "It was on Fire When I layed Down on It." It's the story of a little girl and her paper sack filled with the things she holds most dear but to anyone else looking into the bag it looks like trash. That is exactly how Logan's treasures are. Now that we have a puppy that eats every small item left on the floor, the treasures need to be in a controlled environment. And it hurts my heart to make him throw them away immediately. 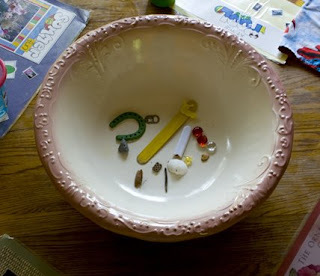 The big ceramic bowl on the dining room table (a recent freecycle find) is now home to Logan's treasures. We can talk about them at dinner and help create conversation and stories about his treasures. In every nook and cranny of our house is the opportunity for learning and helping Logan find his way in the world.